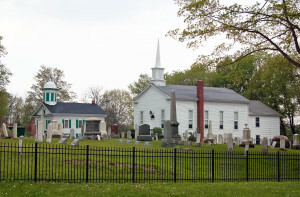 The view above shows two historic structures in Mantua Center, Ohio. 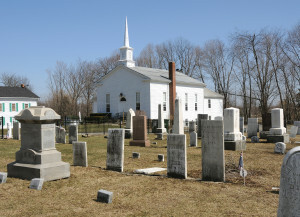 The Mantua Township Town Hall is seen at the left. 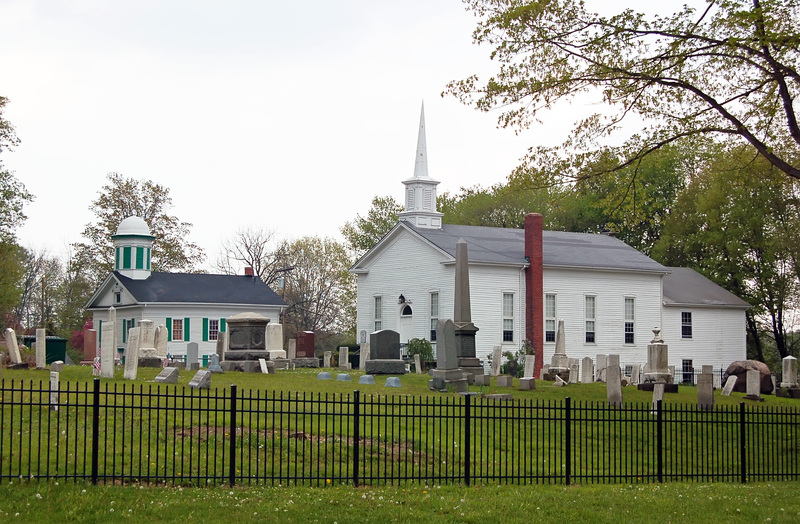 The attractive white church at the right is the Mantua Center Christian Church. It is claimed by members of that faith that building is the oldest house of worship of the Disciples of Christ or Campbellite tradition in Ohio. Once led by Alexander Campbell, it is the denomination Sidney Rigdon came from when he joined the Latter-day Saints. Members of this faith still worship in the structure and kindly allow interested visitors to see the inside of this historic building. 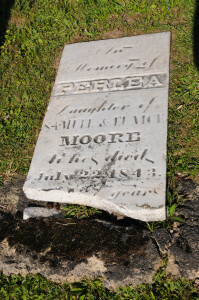 Headstone of Perlea Moore. Photo by Kenneth Mays. The Oliver and Rosetta Snow family, including children Eliza and Lorenzo, were the eleventh family to settle in the township. About one mile south of SR 82 on Mantua Center Road is the home of Oliver and Rosetta Snow and Lorenzo Snow birth home. 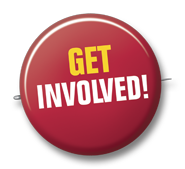 It is situated just north of Pioneer Trail Road. Mantua Center Historic District is located at the intersection of SR 82 and Mantua Center Road (CR 4) in Portage County, Ohio. 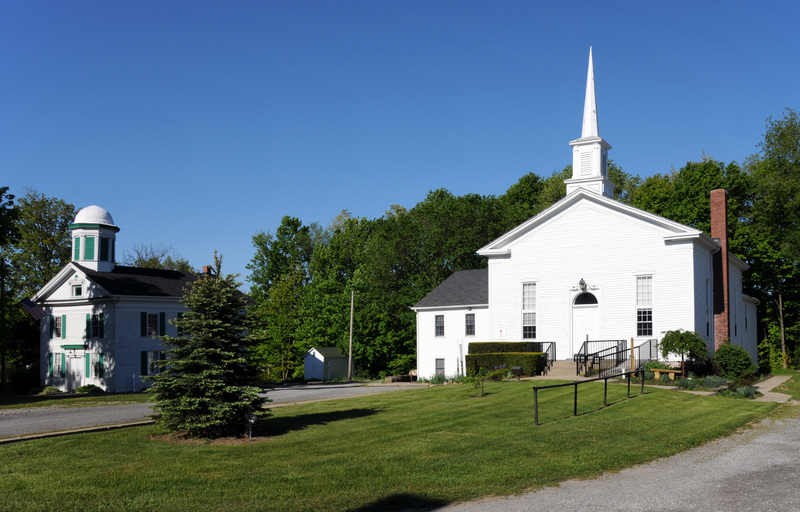 The gps coordinates for the church and town hall are: 41°18’33.57″ N; 81°14’39.28″ W.
Mantua Center Christian Church. Photo by Kenneth Mays. 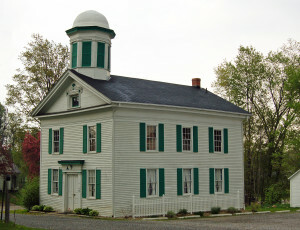 Mantua Township Town Hall. Photo by Kenneth Mays. Keith W. Perkins and Donald Q. Cannon, in LaMar C. Berrett, ed., Sacred Places, Vol. 3, 54-55. Eliza R. Snow, Biography and Family Record of Lorenzo Snow, 2.